In less than two months the FIFA World Cup will take prominent stage in Brazil, which is considered to be a highly anticipated journey for all soccer fans throughout the world. However, this journey has been both severely criticised as well as intensely celebrated by Brazilians and across the world. Let’s look at some of the reasons why Brazil’s FIFA World Cup preparation has been fraught with controversy in some way or the other, ever since it first hosted the FIFA World Cup in 1950. 1. Slow construction work at stadiums and other important arenas. A prime stadium, where England is slated to play their opening match against Italy– Arena da Amazonia– is still under disputation in spite of World Cup preparations being underway for a long time. The stadium, although officially opened for business, is still far from complete as infrastructure work is still incomplete and the stadium is unfit for a soccer match. Situated at the heart of the Amazon rainforest, the stadium opened early this year and revealed a venue of over 42,000 seats. Moreover, of all the stadiums to be readied for the World Cup, three stadiums have yet to be completed while infrastructure in over 12 host cities in Brazil is frantically afoot. Whispers abound in the international circuit about the lack of preparedness for a tournament of a global nature that is sure to start in less than a couple of months. In spite of numerous setbacks, the international body FIFA is aware that at least three stadiums will not be entirely ready for approximately a month before the tournament begins. 2. Procrastination and delayed work. 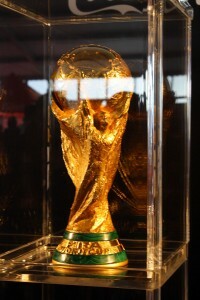 A large number of governing bodies across the world and at FIFA have criticised the host country of initiating its World Cup preparations “way too late.” Most of the senior officials at FIFA are of the opinion that the host country had not grasped the scale of work that would be involved in preparing the nation for a tournament of such massive proportions. In the history of World Cup hosts, FIFA officials believe that no country has ever been so far behind in preparing itself for the World Cup, in spite of Brazil having had over seven years to prepare for the tournament. 3. Citizens protest. Within the country itself, a large number of Brazilians have come out in the open to publicly criticise and denounce the many factors undermining the preparations for the World Cup, such as high levels of corruption and high costs of preparing the stadiums and infrastructure. In June 2013, over 1 million Brazilian protesters came out on the streets in over 80 Brazilian cities and vocally criticised the Brazilian president for hosting the World Cup in the country. In spite of soccer being Brazil’s favourite and best loved sport, majority of the citizens view the World Cup as a huge unnecessary expenditure only for a one-time event, which could have otherwise been used to fund desperate areas in the country such as overall infrastructure, public health care and education. 4. Rising death toll. Brazil has been plagued not just by unpreparedness, corruption, high expenditure and delays but also fatal accidents. At the moment, there have been not less than six constructions related fatal accidents at prime stadiums across the country, with majority of the fatalities taking place in the city of Manaus. 5. Poor planning and rising costs. Brazil is slated to spend not less than $ 4 billion for the World Cup event, on the stadiums itself. Critics opine that these stadiums will not be used in an efficient manner after the event has subsided and hence they believe that the money spent on preparing the stadiums is a colossal waste. When Brazil was awarded to host the cup way back in 2007, leading politicians promised that billions of dollars would be spent on upgrading the airports, infrastructure projects across the nation, subway lines and other important transportation mechanisms to equip the country for the game as well as for the benefit of the people. Unfortunately, much of the financing has yet to come to fruition while a number of efforts have been cast aside.